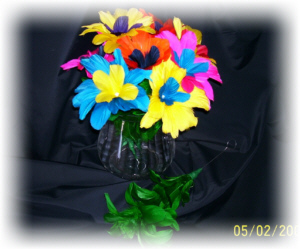 These single blooming flower are approximately 12" long "in bloom"
Top quality made in USA. 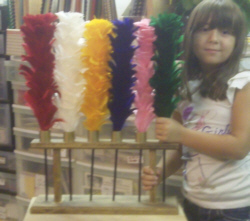 FL42947 COLOR CHANGING PLUMES & STAINED STAND - 10 piece set consisting of 9 beautiful colorful large feather plumes plus wood tabletop plume stand. An empty, clear plexiglass, square tube is shown resting on an attractive black and red pedestal. The performer shows a single white flower to the audience and throws it into the tube. He immediately picks up the tube and a beautiful nine-bloom bouquet of flowers appears on the pedestal! The tube stands 11 1/4-inches tall VisualColorfulEasy to setEasy to performPacks smallPlays bigQuality craftsmanship. No instructions.